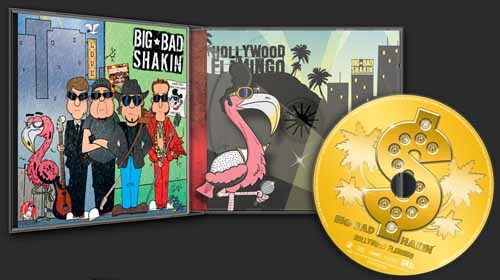 CD+Download-Album “Hollywood Flamingo” von Big Bad Shakin’. Release date CD: 21.10.2011 release date Digital: 25.11.2011. Wenn sich sakrale Syntheziserklänge mit Akustikgitarre mischen, leise Congas einem frischen Tag in der Savanne Zentralafrikas den Odem einzuhauchen scheinen und sich eine behaarte Männerbrust verschämt in frivol rotes Licht getaucht an einen glanzpolierten Konzertflügel lehnt, ist Eines klar: BIG BAD SHAKINÂ‘ spielen dort an diesem Abend nicht! Wenn jedoch massive Gitarrensounds und ein rumpelnder Bass gemeinsam mit modernen Drumbeats und einem notorischen Jerry Lee Lewis-Piano auf die Startbahn Richtung Recording Studio rollen, sind BIG BAD SHAKIN’ wie gewohnt in Hochform. Neben dem mächtig und erdig auftretenden “Crazy Sue” und der Southern Rock-Hymne “Do what she wants” findet sich in “You don’t give a dive” ein durch Rapper Tone-Loc bekanntes, eingängiges Drum-Lick, innovativ verarbeitet in einem modernen Skate-Song. Die vier Berliner zeigen positiven Mut zur Neuheit und kombinieren zwanglos und gekonnt Disco-, Skate- und Hip Hop-Elemente, ohne dabei ihre Linie aufzugeben. Generell hat man das Gefühl, Elvis würde heute ähnlich klingen, wäre er nicht 1935 sondern 1985 geboren. Sicher ein Highlight des vergoldeten Rohlings: Das zusammen mit dem Deutschen Filmorchester Babelsberg eingespielte “True love travels on a gravel road”. Eine monumentale Ballade mit Las Vegas-Faktor, die den Zuhörer anrührt und aufrüttelt. Zum Weinen schön. Der sich anschließende Ohrwurm “I’m so glad” groovt wie Hexe und hat genau wie der Klassiker In the summertime Hit-Potenzial aus dem Hinterhalt. Jerry Reeds “Guitar Man” wurde wohl noch nie so brutal eingespielt und erinnert in Teilen an den Stil der dänischen Band Volbeat – irgendwie aber doch nicht, denn Sound und Arrangement sind doch zu eigenständig. “She’s a rocker” und “This ain’t makin’ me dance” sind würzig abgeschmeckte Rock’n’Roll-Tracks, “The only one” zieht einem in 1:41 den Scheitel längs. Die schalkhaft trällernden Bläser und ein Steel Drum-Solo im L’amour-Schleicher “Oh Darling” gehören auf jede Karibik-Kreuzfahrt und sind – so hollywoodig verwendet – wohl nur bei BIG BAD SHAKIN’ aufzufinden. Den runden Abschluss schaffen die vier für ihre legendär verrückten Live-Shows bekannten Ex-Halbwüchsigen mit “Stone-cold hypnotized”, das sich leistet, echte Drums mal auf Club-Techno zappeln zu lassen. Und nach 2797 Sekunden Musik einschließlich eines Intros, dem neben Hardrock-Star Tommy Heart auch RTL-/n-tv-Anchorwoman Annett Möller die Stimme leihen, lehnt man sich zufrieden und erschöpft zurück, drückt nochmal die Play-Taste und geht auf Big Bad Klassenfahrt mit handgemachtem, modernen Rock’n’Roll. BIG BAD SHAKIN’ – they’ve done it again! Lick Eiä! Zu finden auf allen guten Onlinestores (Amazon, iTunes, Napster, eMusic etc.). Unterstützen Sie den Künstler und kaufen Sie die Musik. Copy kills music! Backing Vocals: Big Bad Shakin’. Intro by Annett Moeller, Tommy Heart and Louis Sesto. Brass section: The Holger Flash Quartet (Erich Otto, Holger Flash, Oliver Oliver). Brass arrangement by Tommy Remm. “True love travels on a gravel road” recorded in collaboration with the Babelsberger Filmorchester, Potsdam. Steel drums by Montell “The Phantom of St. Kitts and Nevis” Nehemiah. Music & composition of all songs by Big Bad Shakin’, published by Edition Roxon Musikverlag. Except: “True love travels on a gravel road” written by D. Frazier/A.L. Owens, “Folsom Prison Blues” written by Johnny Cash, “In the summertime” written by Ray Dorset, “Guitar Man” written & composed by Jerry Reed. Arrangement by Big Bad Shakin’ & Tommy Remm. When the sacred sounds of a mystic syntheziser mix with a traditional acoustic guitar, silent congas seem to whisper the breath of a fresh morning in the savanna of central Africa, and the hairy chest of a true man dipped in frivolously glimming red light bashfully leans against a mirror-finished grand piano, one thing is for sure: BIG BAD SHAKIN’ play elsewhere tonight! But if a massive guitar and a rumbling bass blended with modern drumbeats and a notorious Jerry Lee Lewis-piano are ready to get airborne, BIG BAD SHAKIN’ are dashing in peak form again. Rock or crawl! With their third album Hollywood Flamingo BIG BAD SHAKIN’ pop out a Rock’n’Roll milestone into the CD-shelves, -stores and download communities worldwide. 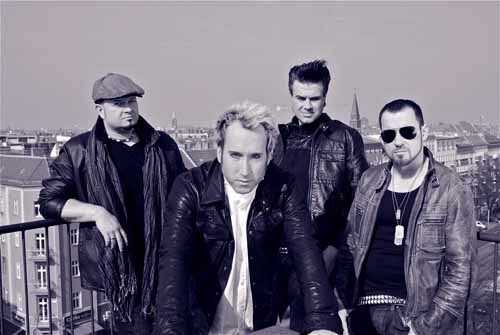 A total of 16 stoutly baked songs from the hell’s kitchen of the four rockers, and produced by trendsetter Tommy Remm of Valicon, Berlin (Germany), make your ears ring, your heart jump and your throat pant for a pitcher of an ice-cold brew. Alongside the fulminant “Crazy Sue” and the down-to-earth Southern Rock hymn “Do what she wants” you will soon cross your path with “You don’t give a dime”. A bold track featuring a well-known and catchy drumlick initially made famous by Rap legend Tone-Loc, here conveniently melted together with rock-hard elements to make a splendid skate song. 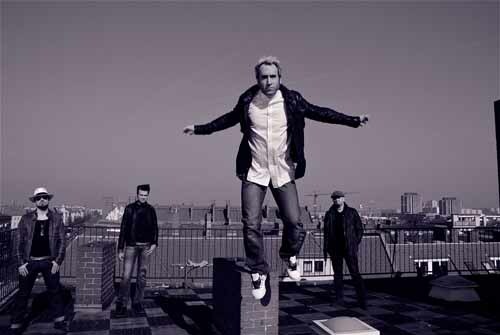 Once again, the four lads from Berlin proof audacity for innovation and merge Disco-, Skate- and Hip Hop-elements off the cuff without even thinking about abandoning their path. Across-the-board – and repeatedly – it feels as if Elvis could sound quite the same today, if he was born in 1985 instead of 1935. An airtight highlight of the lustrous golden disk: ‘True love travels on a gravel road”. A monumental, Las Vegas-type ballad recorded in collaboration with the German Movie Orchestra Babelsberg, and destined to startle and unsettle the listeners. The catchy “I’m so glad” grooves like witch and possesses, just like the classic “In the summertime”, the clear signs of radio hit potential from ambush. 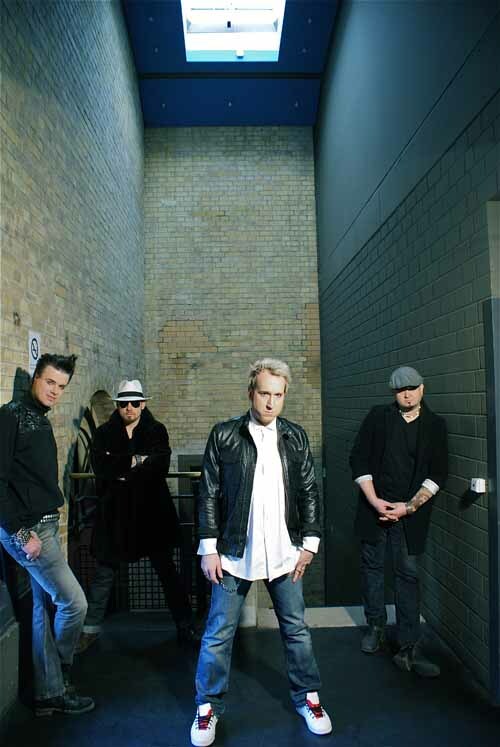 Jerry Reeds “Guitar Man” has probably never been recorded in a nearly brutal manner and draws a line to Danish rock band “Volbeat” – with every second preserving its outstanding individuality. “She’s a rocker” and “This ain’t makin me dance” are convenient and spicily recorded Rock’n’Roll tracks for long journeys on highways and byways, L.A. rocker “The only one” will be parting your hair lengthways in just 1:41. The waggishly warbling brass and a steel drum solo in the crooner-style “Oh darling” make this song a must on every sea cruise and will be found in an equally hollywoody fashion most likely only on BIG BAD SHAKIN’ recordings. The four guys, well-known for their legendary and crazy live shows, have taken care for an exactly timed finish and put “Stone-cold hypnotized” at position 16 of a truly enthusiastic and brilliantly-arranged CD. And after 2797 seconds of music, including a breaking news-intro featuring hard rock star Tommy Heart and RTL / n-tv-anchorwoman Annett Moeller , you’ll lean back with satisfaction and grateful exhaustion before pressing the play-button again to check in once more for yet another school trip with hand-made, modern Rock’n’Roll by BIG BAD SHAKIN’ – they’ve done it again. The flamingo has landed! Lick Eiä! Support the artist and buy their music. Find our music at all good online stores like Amazon, iTunes, Napster, eMusic etc. * Flamingos (or flamingoes) are wading birds in the genus Phoenicopterus, the only genus in the family Phoenicopteridae. Most sources recognize six flamingo species. Three of these flamingo species can be found in the Americas, two species in Old World bars and dubious internet chat rooms, and one in the Hollywood Rockin’ Cartoon Pop circuit. Flamingos often only stand on one of their two legs. The reason for this is obvious: Flamingos – just like most guitar players – tend to pass out after just one alcoholic beverage, but would need at least two to have their second leg activated. Some suggest that Flamingos have the ability to have half of their body go into a state of sleep. When one side is rested, the flamingo will swap legs, go into a bar, have a couple of beers and then let the other half sleep. Recent research has indicated that standing on one leg instead of two or three may allow Flamingos to conserve more body heat. This makes them tough opponents in underheated truck stops, on Himalaya expeditions, and in budget motel rooms.